I love, love, love my Canon iPF6300 printer. It’s been a joy to use that has been much less hassle than my Epson 3880 and 4900 (which are excellent in their own way), but I’ve missed my beloved Epson Exhibition Fiber paper (EFP). I know from feedback from my readers and sales reports that many of you are switching from Epson to Canon so you’ve probably been wondering the same thing I have – is there an equivalent to EFP from Canon? From my research I’ve found Canon Polished Rag to be the closest thing to EFP and honestly I think it is just as good, but I haven’t been able to get it in 24” rolls. As a result I’ve been using Canon Premium RC Luster which is excellent too and doesn’t have the same issues with curling that EFP and Polish Rag do. I’ve found the built-in profile to be great for every day prints – especially in-camera JPEG’s with no post-processing (it’s amazing with those), but for those with a fine art color managed workflow you’ll want to generate your own with something like ColorMunki or i1XTreme for the most accurate results as the built-in profile does take some liberties with saturation and some minor color hue shifts. On Epson I generally find that Relative Colormetric is my preferred rendering intent, but on the iPF6300 I have a strong preference for Perceptual. In fact, some papers such as this one offer a Perceptual (People, Dark Areas) rendering intent (only in the print plug-in) which I find to be fantastic most of the time. I choose that option whenever it is available. This extra rendering intent does take the liberty of making some adjustments to your image so some may not like it, but I find that it makes for great skin tones and offers a much greater tonal range of blacks than the other rendering intents (at least for the built-in profiles). 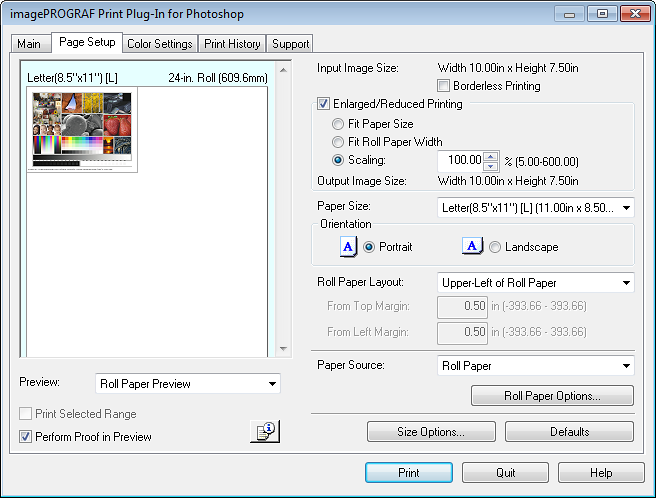 I have tested this paper with Photoshop CS4 for Windows, Photoshop CS5 for the Mac as well as Lightroom 2 & 3 for the Mac and PC and finally QImage. For everything but Photoshop you are stuck with using the OS driver rather than my preferred Export Module / Plug-in which is available for Microsoft Word, Canon DPP, and Photoshop. 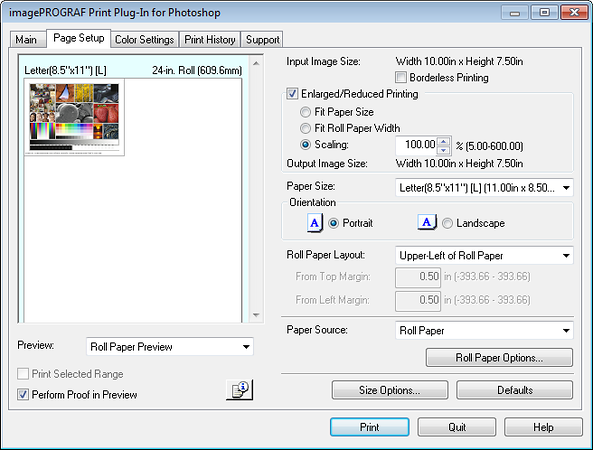 The Export Module / Plug-in produces the most accurate print jobs because the software doesn’t interfere with the data sent to the printer so your soft proofing from it can be accurate if your display has been calibrated. When using the driver the third party software products can sometimes introduce color shifts which can be pleasing (as is the case with QImage) or horrific (as is the case with Photoshop CS5). In my article entitled Printing Family Photos for Normal People I used this paper with QImage to print a bunch of in-camera JPEG’s with no additional post-processing and the results were excellent. They weren’t theoretically accurate from a color managed workflow perspective, but what I’ve discovered is that Canon has tested its printers against its in-camera images and knows that workflow well. 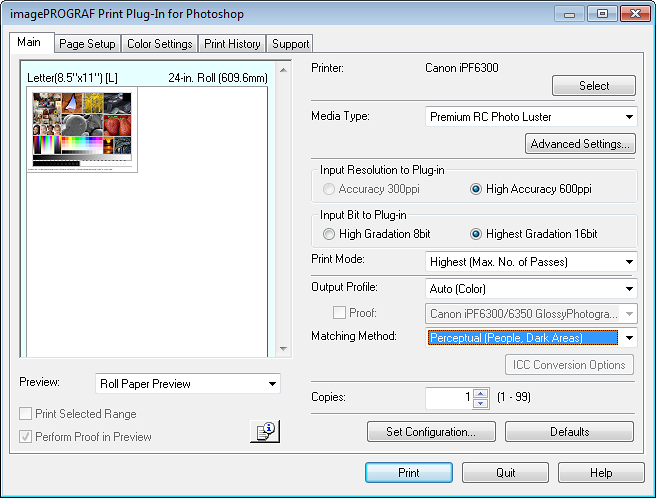 If you simply shoot an image and send that in-camera JPEG to your Canon printer (in my case a iPF6300) without doing anything else you’ll get an excellent print when using Canon papers. For photographers doing high volume work like school sports or school portrait/prom work you may find the results to be satisfactory enough that you can eliminate post-processing from your workflow (assuming there are no distractions that require the content-aware healing brush or clone stamp tools). This also assumes you got your in-camera settings right – including the crop. Now I’m super picky about my workflow so I wouldn’t do this for my fine art or commercial work, but those are images that sell for hundreds to thousands of dollars so those customers deserve a much more exhaustive end-to-end solution. However, if you are selling $14.95 Santa photos or something then you’ll get a fabulous end-to-end result that allows you to save a bunch of time and avoid the headaches of post-processing so that’s a huge benefit. Canon proved this point to me when I was at the Winter Olympics in Vancouver, BC, but I’m a true believer now that I’ve done it myself with over 300 of my own personal photos. Canon’s full PDF on this paper can be found here. 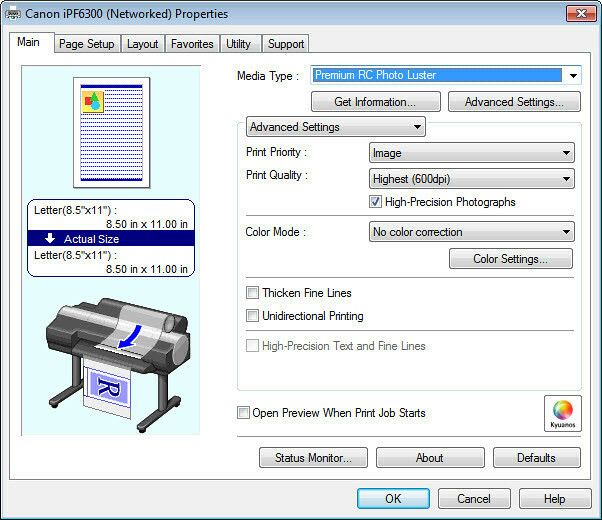 For this printer I only used the profiles that Canon provides with my Canon iPF6300 printer and I was pleased enough with the results that I didn’t feel compelled to generate my own paper profile. I also did not try to use this with a RIP. As you’ll see later in the walkthrough I also found that when using the Canon plug-in that if you have the media type listed that choosing Auto for the Output Profile is acceptable because the software is intelligent enough to choose the proper ICC profile based on the settings you choose in the dialog (i.e., highest max passes versus highest require different ICC profiles). Based on advice from Eddie Tapp I tested this feature and found it to work enough that I trust it now. I preferred Canon’s Export Module’s “Perceptual (People & Dark Areas)” rendering intent the most for my people shots. When doing my black and white prints I found Auto Mono Neutral to be my preferred choice (much more so than printing in color – but for color printing of black and white images Relative Colormetric was better). 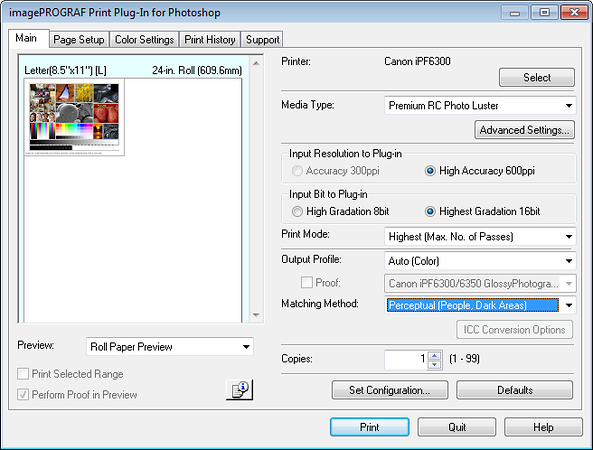 When soft proofing in Photoshop I found that the Relative Colormetric rendering intent most closely resembles the result I see when printing using the Perceptual (People, Dark Areas) rendering intent. However, I didn’t like like the Relative Color metric rendering intent for actual printing. Usage on the PC is identical to the Mac but the OS driver dialog looks a bit different. You should still watch the videos above, but here’s some screen shots to help make sure you set everything properly. I had this paper for several months before I really began to appreciate how good it is. It’s thick, but not so thick that it curls like crazy. It feels very professional and prints from it look great. It’s much cheaper than Canon Polished Rag (back when you could buy it) so it’s a great value too. I feel that it is much more substantial than Epson’s Ultra Premium Photo Paper Luster which feels much more flimsy and cheap, yet produces excellent color prints as well. I highly recommend Canon Premium RC Luster (available at B&H). It works extremely well with my Canon iPF6300 so I’ll be using it primarily for family photos and prints I give away as gifts to friends. I feel its quality is high and its price is affordable enough to make it a great choice as a high quality high volume paper. Canon has provided me with a printer and paper for the purposes of reviewing these products for my blog.I may get a commission if you purchase using the links in this article, so thanks for your support! Stupid newbie question: Why can't you use Epson paper in a Canon printer? You can use any paper that will fit in your printer, BUT you need a media configuration AND a paper profile to get usable results. 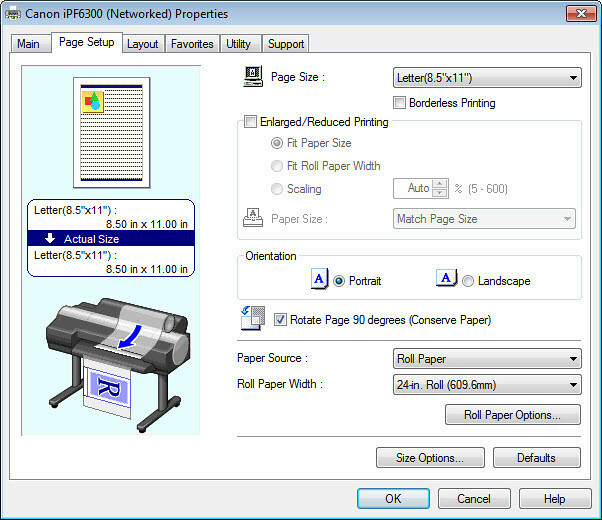 With the right tools and knowledge you can generate your own, but the pre-existing availablity of those for Epson paper on the model of Canon printer is going to be rare. Using a ColorMunki and the not well documented media configuration tool you can get a good start towards a usable result but you will also waste at least 7 sheets of paper so it's also expensive. To get a paper profile as good as some of the built-in done with higher end spectrophotometers and $1495 profiling software will set you back around $2200 - $3500+. It is also a time consuming process so generally speaking it's very handy to use papers that have been pre-profiled and configured for you printer. Oh look out its "Ohmma" the one you have to fear.. LoL. Just be sure to tell her you are also the "Ohpah" and not to treat you "Napo"... You never did say if you have learned Korean or not? I am curious as I enjoy speaking several languages myself. I find it a great way to open doors with people and lots of fun to learn. 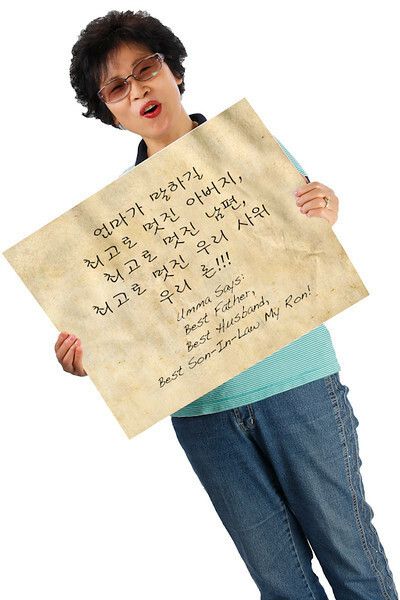 No, I only know a little bit of Korean.